(On Cable TV, October 2015) I wish I liked this film a bit more. On some level, it’s a fascinating take on the American dream, filled with ironic use of America-the-great rhetoric, presenting Masters of the Universe (Olympians, Billionnaires) as pathetic lost souls. That’s the kind of contrarian message that appeals to me, and using that kind of thematic material to showcase dramatic performances by Steve Carrell (unrecognizable), Channing Tatum and Mark Ruffalo should be enough. 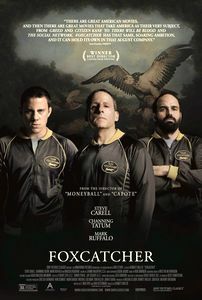 But that’s not counting on the slow and dreary tone used by the film: From the first few minutes onward, it’s obvious that Foxcatcher can’t be bothered to make its points in thirty seconds if it can make them in sixty: the film is dark, bleak, slow and almost insufferable in how it seems determined to revel in misery. The crime on which this true story revolves is presented almost as an afterthought. It is, quite consciously, not a pleasant film to watch and by the end I felt as if life itself had been sucked out of me. Good film? Maybe. Something I’d recommend? Almost certainly not.